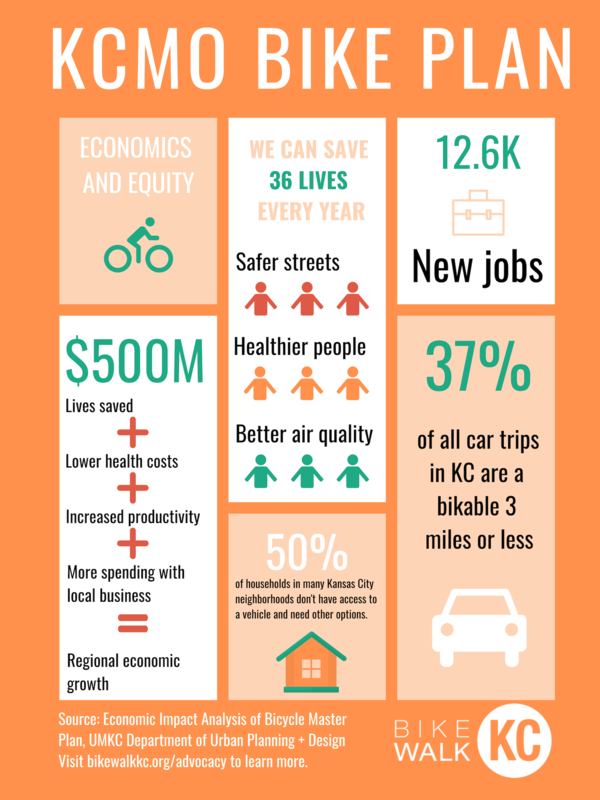 BikeWalkKC is working with researchers at UMKC to conduct an Economic Impact Assessment and a Health Impact Assessment of the new Bicycle Master Plan. Early results show some very tangible benefits to Kansas City’s economy and health. The new bike master plan gets a hearing at City Hall on April 11th 18th at 9:30 am! Let’s show our elected officials that there is strong support for approving the new bike plan. Help us show our elected leaders there is strong support for the health, safety, sustainability, and economic returns that will come from investing in bikes. 20-year increase in regional economic activity due to lives saved, lower health care costs, increased productivity, and a shift of spending from cars to local businesses and services. The total return on the city’s investment in new bike infrastructure far exceeds the estimated cost of tax dollars needed to build the bike network. Generated by the increased economic activity. Not counting jobs created in construction of new bike infrastructure. The economic boost for Kansas City results in a $400 increase to the average household income. This is a very bikeable distance. Most of these trips are currently in cars, but are also the greatest opportunity to convert to bikes. Owning a car costs $9,000 a year. For a someone on Missouri’s minimum wage, that’s half of their income. Transportation is the top source of greenhouse gas emissions in Kansas City. A fully-implemented bike network will reduce KC’s carbon footprint by up to 200,000 tons of CO2 per year. Kansas Citians are already biking more than would be expected by the existing built environment. This is a sign of high interest and latent demand. The lack of infrastructure is the major barrier to more biking. Posted in KCMO Central-South, Local, News, Northland and tagged advocacy, biking, economics, Health, kcbikeplan, kcmo, planning.